Analysis: Hockey no longer Miami’s top sport? 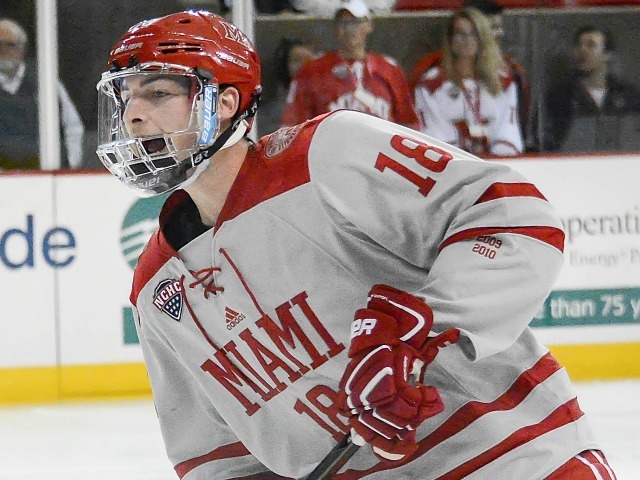 OXFORD, Ohio – So it’s official: Miami will enter the NCHC Tournament with a losing record for the third time in four years. 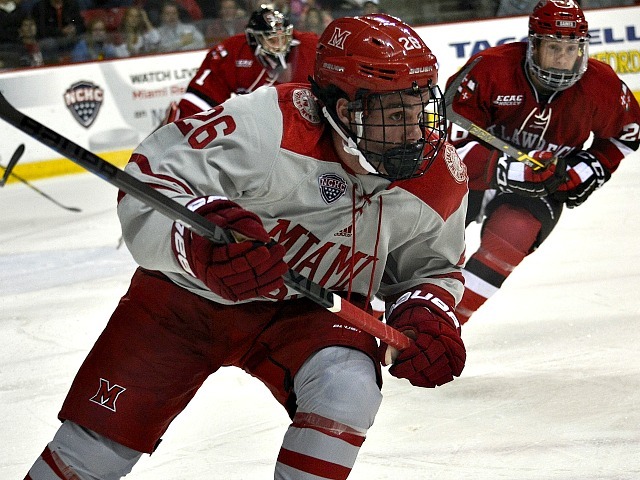 That seemed like an inconceivable concept four years ago when the RedHawks joined the newly-formed league, having at that time qualified for eight straight NCAA Tournaments, including a pair of Frozen Four berths and a national championship game appearance. Yet, here we are after the RedHawks suffered their second consecutive 5-2 loss to No. 2 Denver at Cady Arena and their fourth straight defeat overall. They are 1-7-1 in their last nine. 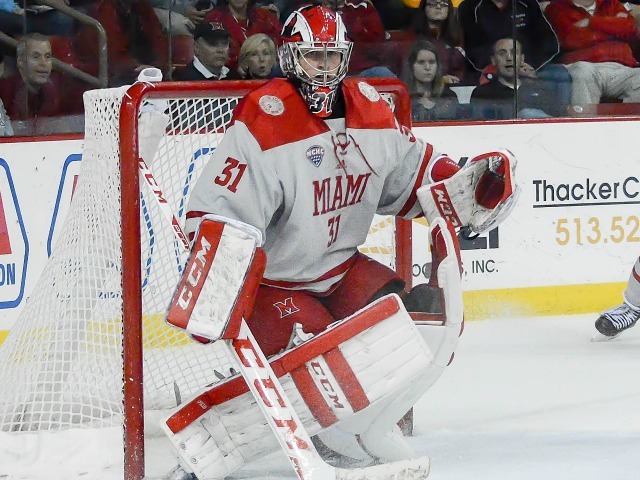 One of the tougher things to comprehend about this extended swoon is that Miami (9-15-6) is hosting the NCAA regionals for the third time since 2013, and now there’s about a 90 percent chance the RedHawks will not play a single NCAA Tournament game in Cincinnati. And many have been so upset about Miami’s placement in the NCAA brackets over the years. It’s fair to say fans, players and coaches have no right to complain about that ever again. 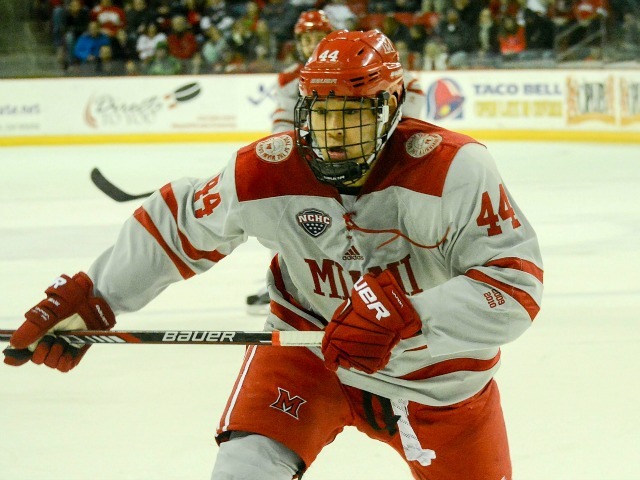 This spring the RedHawks would’ve traveled a whopping 35 miles south for their regional games, and the Frozen Four is just a five-hour bus trip away in Chicago, a city no college hockey team calls home. 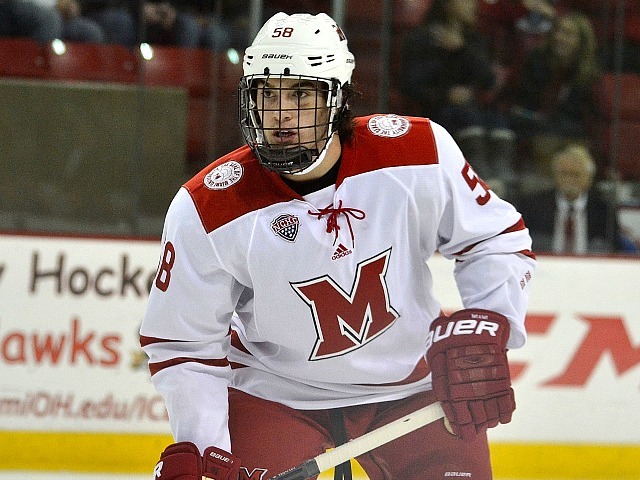 Hockey has been THE sport in Oxford since the Goggin Ice Center and Cady Arena opened in 2006, with students camping out in front of the facility for days just to get into games when Miami was regularly the top-ranked team in Division I. The number 3,642 was ingrained in the heads of those who followed the program: That was the attendance figure when games were sold out, which was almost always in the first half decade of the new facility. 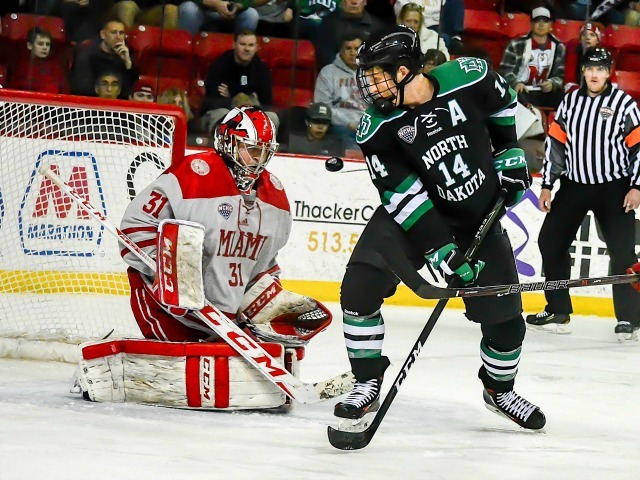 In 2016-17 the high-water mark was 3,032 vs. Nebraska-Omaha, perhaps because some thought the “O” on the Mavericks’ jerseys stood for Ohio State. The RedHawks are averaging 2,528 this year. Football has always been an easier sell in southern Ohio, and those RedHawks wrote quite a story this season, starting 0-6 before winning their last six and falling by a point in their bowl game. They averaged 17,110 in 2016, and while of course schools have plenty of crossover fans, at a school like Miami that is in a rural area with many of its alumni an hour or more away – often much more – it doesn’t take a genius to realize more of those graduates will bring themselves, their families and their money to Yager rather than the ice center a mile south this fall when they visit Oxford. In sports, fans have short memories and winning solves a lot of problems. Team morale and fan support – the latter of which ultimately generates that all-important revenue – will go away when this program starts winning again. 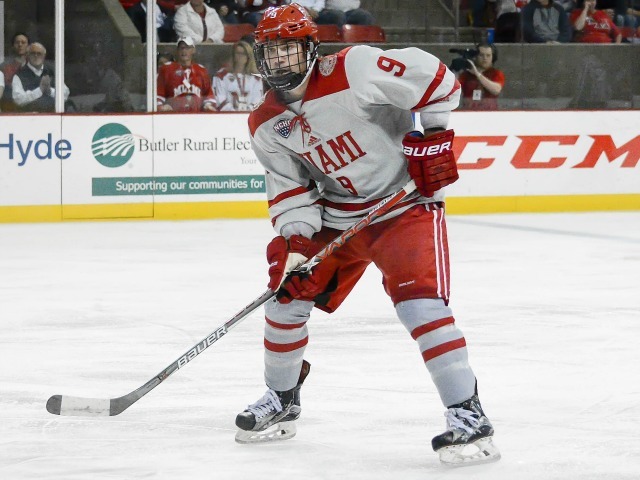 The sooner that happens Cady Arena can sell out games again as it tries to regain its spot atop the Miami sports pecking order. – One of the most disappointing things about this 1-7-1 slide is there’s little fire being displayed. Some decent hits are being dished out, but goalie Ryan Larkin gets poked at and bumped on a regular basis and rarely has anyone shoved an opponent out of the crease. For that matter, when’s the last time there was any kind of skirmish? Not advocating a 1970s Boston Bruins line brawl, but some opponent hatred would be nice to see. This is the fourth season of the league, so the players are all too familiar with each other, yet there seems to be almost no animosity. This season Miami is not one of the most skilled teams in the NCHC, so it needs to grind out wins, and emotion is a huge part of hockey. 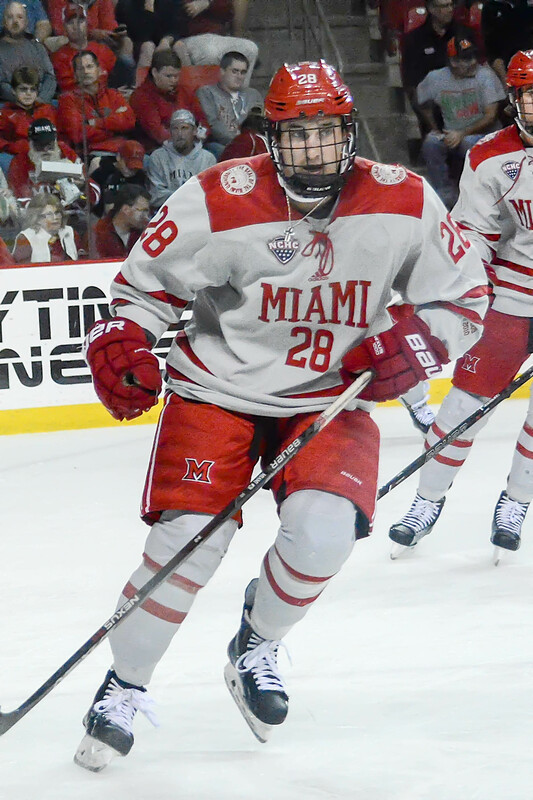 Louie Belpedio played on the edge the most when Miami was reeling off five straight wins, but he had gotten away from that during this skid. And he’s the captain, so the example to the rest of the team comes from the top. Then when Belpedio was injured late Saturday, Jared Brandt did some light shoving but everyone else on the ice seemed checked out. Kind of mind blowing that your captain is laying on the ice, the victim of a kneeing major, and only one player on the ice seems upset. – Speaking of injuries, Kiefer Sherwood got banged up late in the second period, giving everyone quite a scare, but he not only returned for the third period but seemed to be back into that game-takeover mode we’ve seen on occasion. – Despite having just two true scoring lines, Miami was scoring at a decent clip, but the offense has dried up the past few weeks. The RedHawks have scored just 12 times in seven games and have netted more than two goals just once in that span. When you figure that MU has five of those goals have been on the power play and one more was shorthanded, the team has just six even-strength markers in seven games, or 0.86 per. – And it’s been open season on the Miami net in the third period. Opponents have scored 12 times in five games in the most previous five games. Three of those were empty netters, but that’s still 1.8 per game with a goalie in net. – Some of the leadership on the team has been disappointing in recent games. Anthony Louis picked up an assist, but he’s an assistant captain and is not playing like one. Too many turnovers, too little interest in any aspect other than offense. Belpedio had not been playing with that edge he had earlier in the year, when he got under the skin of opponents. Not sure how they’re perceived in the locker room, but despite being sophomores, Grant Hutton and Josh Melnick have done a better job of leading by example on the ice. – Larkin has been sensational this season, but after the fifth Denver goal it was probably time to give him a rest. The last thing a team wants is its goalie lacking confidence, and a season like this could send a netminder to the psych ward. – Gordie Green doesn’t seem to have a confidence problem. He seemed a bit cautious early this season, but he generated two breakaways and was a nightmare for Denver on its power plays. FORWARDS: D. Carson Meyer’s shot that resulted in the first Miami goal was sweet, but there were few other positives among this corps. Really liked Zach LaValle’s hard-nosed play, and Sherwood seemed rejuvenated in the third period after getting banged up. Twelve forwards generated 17 shots and were outclassed by Denver overall in every aspect. The RedHawks did fare better on draws, going 30-32 with Sherwood finishing 9-9. DEFENSEMEN: C-. Hutton ripped home the second Miami goal on the second power play unit, and he finished with five SOG, which is just as solid a strategy for that corps as any other, as the RedHawks have three PPGs from their non-top four forwards, with two by Gordie Green, who is transitioning to that top line. It was Hutton’s third power play goal of the season. For the most part it wasn’t a good night for the other five, with Scott Dornbrock and Grant Frederic struggling early. 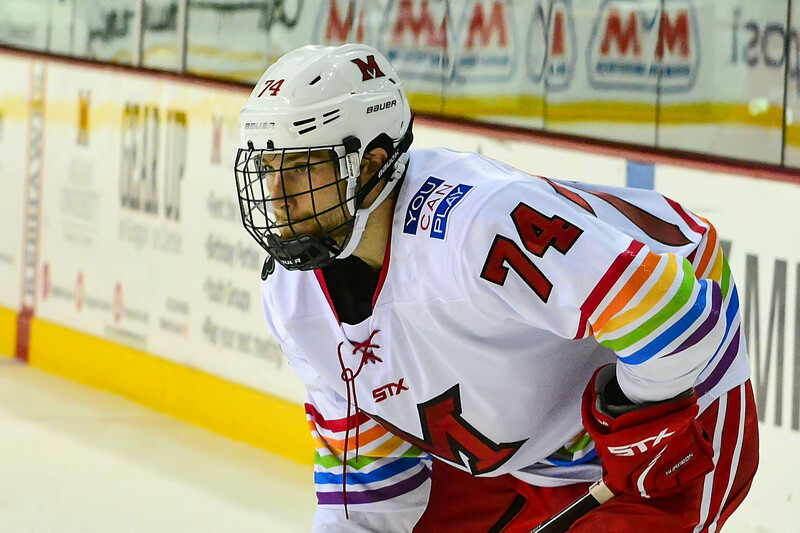 Denver finished with 38 shots, with 16 in the third period while the Pioneers were leading. This group still seems too eager to jump into the play in non-pinch situations. GOALTENDING: D+. It’s so difficult to grade Larkin poorly, because even when he allows a borderline goal, he typically stops one that most wouldn’t to counter that. But in this game he surrendered a weak second goal, was beaten on a wicked shot for Goal No. 3, and he should’ve had the fifth one as well. He made a couple insane saves, including one in which he sprawled across the crease to cover the post on a one-time. LINEUP CHANGES: Just one: Colin Sullivan was scratched in favor of Alex Alger. That gave Miami 12 true forwards, since Chaz Switzer has apparently cracked the top six, having playing in six straight games. Sullivan dressed in 21 consecutive games.